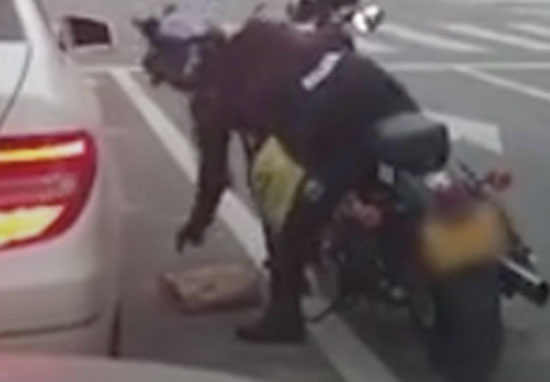 When you think of vigilante bikers this isn’t probably what you’d expect after an annoyed biker stopped a woman from littering by throwing her discarded rubbish back into her car. Seeing people litter is very frustrating – why do they hate the earth? One woman in particular was forced to hold on to her rubbish by a biker who made sure it was returned to its owner. Dashcam footage from a following car captured the moment the woman carelessly threw a cup and paper bag out of her window into the middle of the road while she was held up at a traffic light. Pulling up next to her, the person on the motorcycle bent down to retrieve the driver’s discarded litter, screwed it up and threw it purposefully back through the car window. 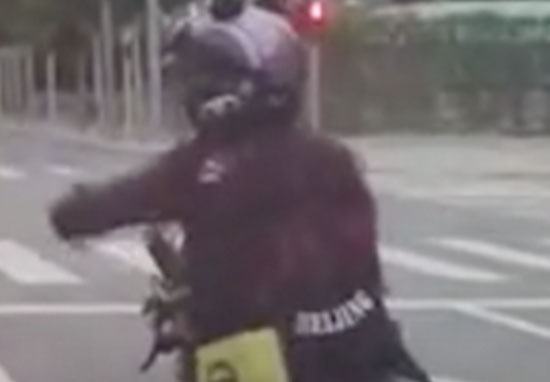 Unbelievably, the woman began pointing her finger angrily at the biker, as if she was innocent in the situation and the biker was in the wrong. The cyclist drove off while the woman started to get out of the car and pointed again at the biker, still appearing to be annoyed, though she had no reason to be. The motorcyclist had just given back what was hers in the first place. Has she not seen any David Attenborough documentaries showing the effects of littering on all the innocent animals? Not to mention the way it turns landscapes and roads into open bins. According to Credit Donkey, motorists are responsible for 53 per cent of all litter produced annually, while paper products make up 22 per cent of the litter that’s currently out there. All because of people like driver in the video! Bikers have been doing good deeds like this for a while now; a motorcyclist in Russia returned a McDonald’s cup to its owner after they’d dropped it on the road. The determined biker picked up the cup in the middle of the heavy traffic in Moscow, Russia, and engaged in what was admittedly quite a mild car chase to make sure it got back to its owner. Pulling up in front of the litterbug, he dismounted his bike and dramatically snapped the cup under one of the car’s windscreen wipers. His clever actions ensured the cup was out of reach from the inside of the car, adding the minor inconvenience that the driver would have had to either get out to retrieve the cup, or deal with it sweeping his windscreen if it started to rain. Hopefully the drivers will have learned their lessons after having their litter returned to them!